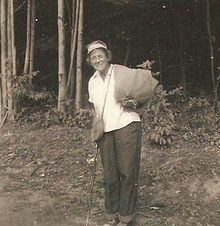 Emma Rowena Gatewood, known as Grandma Gatewood, (October 25, 1887–June 4, 1973), was an extreme hiker and ultra-light hiking pioneer who was the first woman to hike the 2,168-mile (3,489 km) Appalachian Trail from Mount Oglethorpe in Georgia to Mount Katahdin in Maine solo, and in one season. After this feat, she continued to forge new fronts in the hiking world and became the first person to hike the A.T. three times, with her last venture completed in sections. Gatewood was born to a family of 15 children in Guyan Township, Gallia County, Ohio. Her father, a farmer, turned to a life of drinking and gambling after his leg was amputated in the Civil War. The child-rearing of the family, who slept four to a bed in their log cabin, was left to her mother, Evelyn (Trowbridge) Caldwell. At the age of 19 she married 27-year-old P. C. Gatewood, a college educated primary school teacher, and later tobacco farmer, with whom she had 11 children. Almost immediately he sent her to work burning tobacco beds, building fences, and mixing cement in addition to her expected housework duties. Within months of the marriage, he started to beat her, a vicious pattern that continued for the entirety of their marriage. She recalled being beaten nearly to death on several occasions. She survived broken ribs, broken teeth, and other injuries during the abusive marriage. When her husband became violent, she would, on occasion, run from the house into the woods where she found peace and solitude. She eventually successfully divorced P. C. Gatewood in 1940; at a time when divorce was more difficult, and after her husband had repeatedly threatened to have her committed to an insane asylum as a means of maintaining control over her. She had 24 grandchildren, 30 greatgrandchildren, and one great-greatgrandchild living at the time of her death at 85. In 1955, at the age of 67, Gatewood told her grown children that she was going for a walk. They did not ask where or for how long, as they knew she was resilient and would take care of herself. About 5 years earlier, Gatewood read an article in National Geographic about the A.T. and thought "it would be a nice lark," though in retrospect considering the difficulty she added "It wasn't." The magazine gave her the impression of easy walks and clean cabins at the end of each day's expedition. Thus she took little in the way of outdoor gear. She wore Keds shoes and carried an army blanket, a raincoat, and a plastic shower curtain in a homemade denim bag slung over one shoulder. She would later say "For some fool reason, they always lead you right up over the biggest rock to the top of the biggest mountain they can find." Local newspapers picked up on her story in the southern states, then the Associated Press did a national profile of her while in Maryland, leading to an article in Sports Illustrated when she had reached Connecticut. After the hike she was invited on the Today Show. These appearances made her a celebrity even before the hike was over and she was often recognized and received "trail magic" (assistance from strangers) in the form of friends, food and places to sleep. She hiked the AT again in 1960, and then again at age 75 in 1963, making her the first person to hike the trail three times (though her final hike was completed in sections). She was also credited with being the oldest female thru-hiker by the Appalachian Trail Conference. In addition, she walked 2,000 miles (3,200 km) of the Oregon Trail from Independence, Missouri, to Portland, Oregon, averaging 22 miles (35 km) a day. She traveled to every state of the continental United States. In 1970, at age 83, while visiting Appalachian Outfitters in Oakton, Virginia she was asked what she thought about the latest lightweight backpacking gear. Emma advised: "Make a rain cape, and an over the shoulder sling bag, and buy a sturdy pair of Keds tennis shoes. Stop at local groceries and pick up Vienna sausages... most everything else to eat you can find beside the trail... and by the way those wild onions are not called "Ramps"... they are "Rampions" ... a ramp is an inclined plane." Gatewood was a life member of the National Campers and Hikers Association and the Roanoke Appalachian Trail Club. She was Director Emeritus and a lifetime member of the Buckeye Trail Association. Her legacy lives on through various tributes, artistic works, and other commemorative projects. In fact, the A.T. recognized her by including her odyssey in exhibits in The Appalachian Trail Museum. Additionally, in June 2012, she was inducted into the Appalachian Trail Hall of Fame. Other trails in the industry recognized her feats including Hocking Hills State Park in Ohio, where the North Country Trail, Buckeye Trail, and the American Discovery Trail coincide and a six-mile section is designated as the Grandma Gatewood Trail. It connects Old Man's Cave to Cedar Falls to Ash Cave. She has been the subject of projects, songs, and films, including a story-telling program and one act play designed by Eden Valley Enterprises. Additionally,Trail Magic, a 60-minute documentary by Put-in-Bay filmmaker Peter Huston, is about Emma Gatewood. Jeff & Paige, a children's music duo based in Boulder, Colorado, released a song in her honor, titled "Grandma Gatewood", on their 2015 album "Mighty Wolf". In 2018, her story was revived by her feature in the New York Times Overlooked series, which adds stories of remarkable people whose deaths went unreported in the historically male-dominated obituaries of the Times. The piece, a belated obituary, details her hiking accomplishments and abusive family life. Ben Montgomery (2014). Grandma Gatewood's Walk: The Inspiring Story of the Woman Who Saved the Appalachian Trail. Chicago Review Press. ISBN 978-1613747186. Michelle Houts (2016). When Grandma Gatewood Took a Hike. Ohio University Press. ISBN 978-0-8214-2235-9. 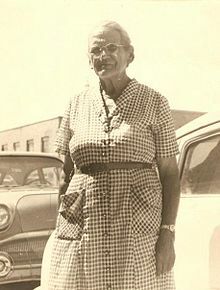 Trail Magic: The Grandma Gatewood Story (PBS documentary). Eden Valley Enterprises and FilmAffects. ^ a b c d "Gallia County Genealogical Society". Archived from the original on April 12, 2008. ^ Katherine Seeley (June 27, 2018). "Overlooked No More: Emma Gatewood, First Woman to Conquer the Appalachian Trail Alone". The New York Times. Retrieved August 27, 2018. ^ "When Grandma Gatewood hiked the Appalachian Trail". Sierra Club. .
^ "Overlooked No More: Emma Gatewood, First Woman to Conquer the Appalachian Trail Alone". New York Times. June 27, 2018. Retrieved 2018-06-28. ^ a b c Ben Montgomery (2014). Grandma Gatewood's Walk: The Inspiring Story of the Woman Who Saved the Appalachian Trail. Chicago Review Press. ISBN 978-1613747186. ^ "SI Vault". Vault.sportsillustrated.cnn.com. 1955-08-15. Retrieved 2013-12-18. ^ Siyapa, Tweeter (2015-03-20). "Traveller Compass: 10 Travelling Phobias You Might Have But You Ignore". Travellercompass.blogspot.in. Retrieved 2015-05-03. ^ "The 2012 Class Of The Appalachian Trail Hall Of Fame | Hiking Around Midstate PA and Beyond: A community blog". witf.org. Retrieved 2013-12-18. ^ American Dreams. "Hocking County Tourism Association". Hcta.org. Retrieved 2013-12-18. ^ "Grandma Gatewood Trail - Old Man's Cave to Ash Cave | Logan Ohio Hikes". Trails.com. Retrieved 2013-12-18. ^ "Grandma Gatewood program". Eden Valley Enterprises. Retrieved 2013-12-18. ^ May 1, 2015. "Film highlights first woman to walk Appalachian Trail alone - Chronicle-Telegram". Chronicle.northcoastnow.com. Retrieved 2015-05-03. Wikimedia Commons has media related to Emma Gatewood.